One of the best parts about traveling in Japan is the train system, which is so efficient and convenient that day trips are an absolute must. Kyoto and Osaka are surrounded by a bunch of fantastic day trip destinations, but my absolute favorite was Nara. 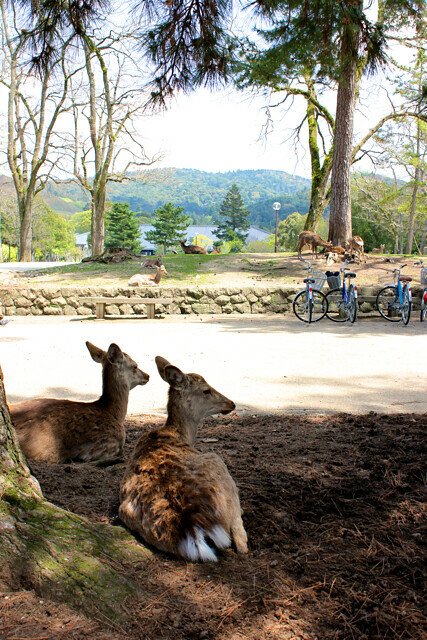 The enormous population of peaceful, friendly, fearless, free-roaming deer make Nara one of the most special places we visited during our time in Japan. Unlike the monkeys that came with scaryish rules, the deer were tame and approachable. In fact, I’d encourage making eye contact with the deer, because their eyes are glorious…dark, deep, and enormous. 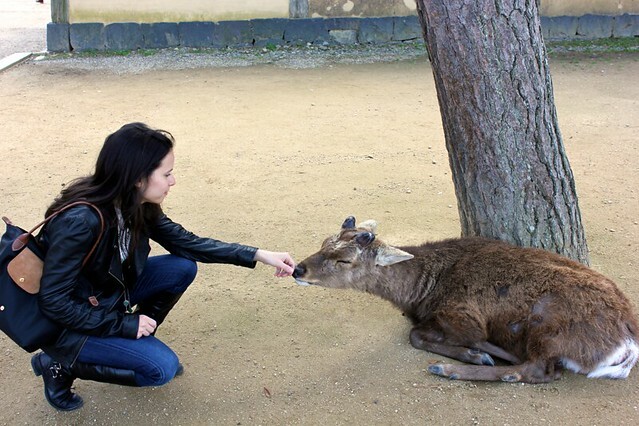 I was hesitant to approach the deer at first, but they let us pet them, rub their antlers, and pose with them. They were dignified. Until they got around deer crackers. Several vendors set up shop selling a stack of deer biscuits (peanut butter flavored) for about $1. The deer LOVED the biscuits and would flock to anyone holding them. It was really fun to feed them, especially the babies. Some of the deer were pushier than others, and one even tugged on the back of my jacket when I ran out of the goods. 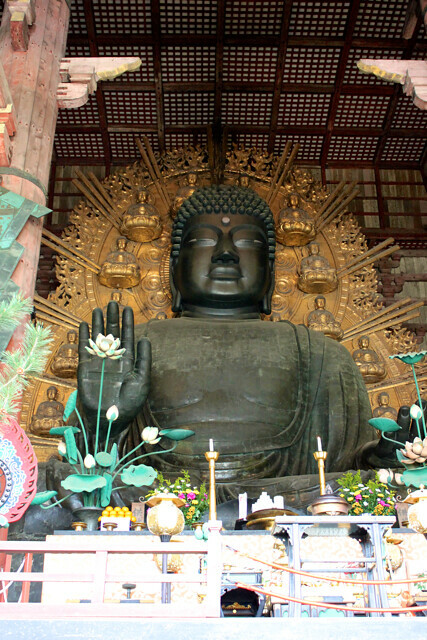 In addition to the deer, Nara is home to the Daibutsu, or the Great Buddha, another incredibly impressive sight. You can’t tell from pictures, but the Buddha is enormous. Approximately five stories tall, and a person my size or smaller should be able to fit through the Buddha’s nostril. Apparently, the temple that houses the Buddha is the world’s largest wooden building. To see the Buddha, you have to pass through a large gate, up a few steps and down a few steps. On the other side is a wide approach, flanked by grass, and masses of people (mostly school children) stream towards the temple. One lone deer stood in the middle of the path facing those who approached, and the stream of people parted around the deer and reunited on the other side. It was magical, especially because the deer are thought to be messengers of the gods. The deer are so special in Nara that they grace the man hole covers, along with cherry blossoms (far right). I love taking pictures of man hole covers when I travel, and the ones in Japan were extra special because each area or town had its own design. Here is a sampling from Takayama, Shibuya, and the Tsukiji Fish Market. But back to the day trips. 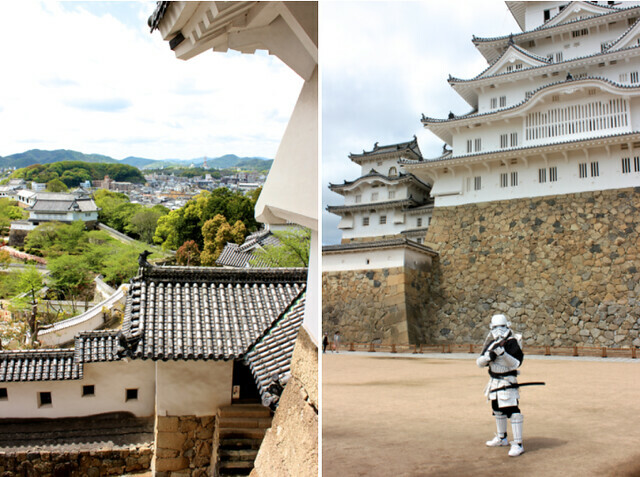 Another fantastic destination is Himeji castle. Dating from the 1600s and recently renovated, the castle is an architecturally stunning fortress. The grounds are rigged with secret perches for shooting arrows and launching other defensive attacks. The inside of the castle is beautifully wooden, with places for weapons and many warrior hiding places. The views from the castle are spectacular. A less exciting destination is Naoshima. Billed as an art island, we had trouble finding the art. 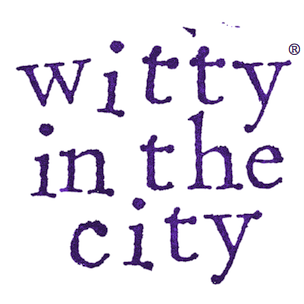 And when we did, it was underwhelming, at least for our tastes. Fortunately, our multi-hour hike around the residential fishing island was gorgeous. And getting utterly lost in such a place gave me one of the few opportunities to really use the Japanese I had spent so much time learning before our trip! It also wasn’t the easiest day trip and required a ferry ride. 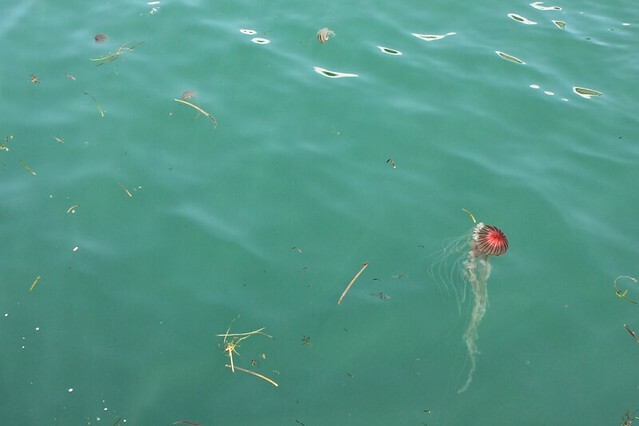 But at least we got to see some beautiful man of war jellyfish and other varieties. Sadly, their presence meant we couldn’t jump off of the island and swim to a more exciting destination. Some out-of-the-way destinations were worth the effort, like Koyasan. That trip, however, should include an overnight stay. Koyasan is the home of Singon Buddhism and is full of monasteries. There is very little to do in Koyasan, which makes it the perfect place to relax and experience inner peace. We stayed in a small and beautiful temple run by welcoming monks. Our room overlooked a manicured courtyard with a koi pond and another courtyard with a zen garden and bonsais. I couldn’t get enough of either view. Breathe in, breathe out. 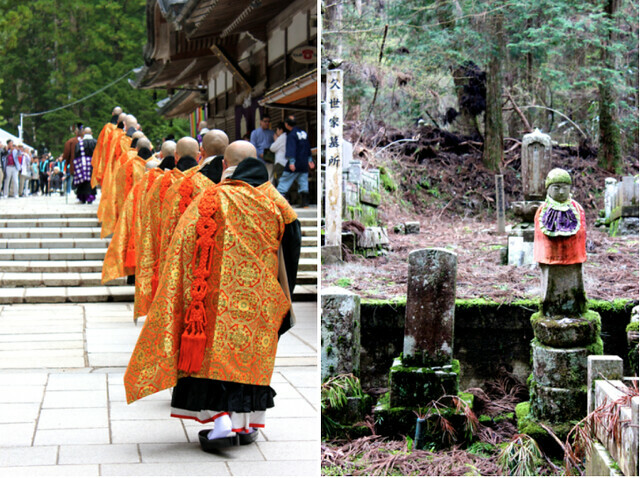 A large Buddhist cemetery is also in Koyasan and packed full of markers, statues, and sights. Although the cemetery itself is crowded with visitors, it’s easy to get off of the beaten path and experience some peace. We also happened upon a procession of monks, throwing cards on their way to a hall dripping with lanterns where they undertook a long and chanting prayer. We also participated in a 6 am prayer session back at our temple lodging with a few of the monks and other guests. A vegan Japanese breakfast awaited us in our tatami-lined room, where we soaked up the peace to fortify our journey back down the mountain and towards home. Pam, I travelled to Kyoto last January with cara’s father. Such a lovely lovely place. 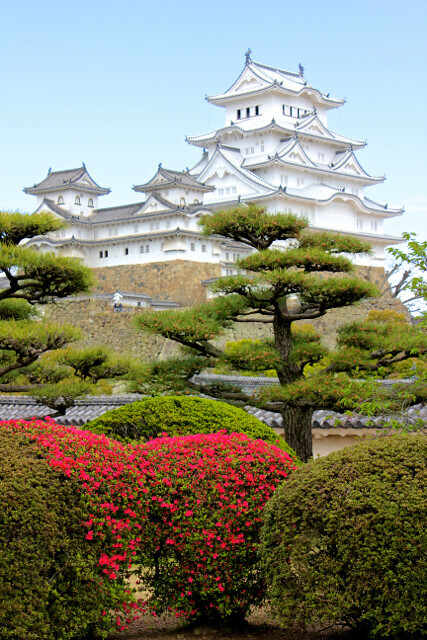 I have thoroughly enjoyed your blogs about Japan and tHe cities you visited. What a magical place!